When folks know you as “The Accidental Hawaiian Crooner” (and you tell people that you carry your ʻukulele with you everywhere you go), it’s not uncommon to be asked to share a song or two. And because I’m a believer of Showing Up and Saying “YES!”, I’m happy to honor a request. When the holidays come around, I know to expect to be asked to share a song at the parties we attend. Of course, there’s the hapa-haole classic, “Mele Kalikimaka.” In fact, that’s what most people request. And I’m happy to strum and sing it for my friends. Written by Mr. R. Alex Anderson in the late 1940s, the song has become somewhat synonymous with Christmas and the ukulele. However, I wanted to expand my repertoire a bit. Jumpin’ Jim Beloff has compiled a great book of Christmas songs called Ukulele Christmas. (He doesn’t use an ʻokina in the spelling.) 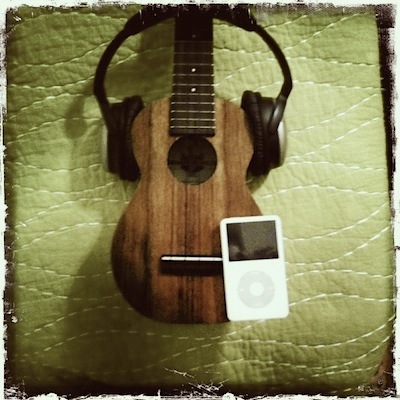 It’s got 30 songs and they’ve all been arranged for the ʻukulele–complete with chord charts and everything you need to get you up and strumming quickly. And to help me out with Hawaiian translations of some “traditional” Christmas carols, I looked to the book NĀ MELE O HAWAIʻI NEI (collected by Samuel H. Elbert and Noelani Mahoe.) There’s a whole section devoted to Christmas songs at the end of the book. And then I started combing through my CD collection to pull songs that I love. Classics like “Christmas Lūʻau” and “Christmas Island” need to be added to my repertoire, don’t you think? What songs are YOU strumming and singing these days? Hawaiian Picnic in Central Park! Yesterday, we had the Annual Hawai’i Potuck Picnic in Central Park here in New York City. And, as usual, it was a blast! I’m told the picnic tradition started over 20 years ago. And a there’s always a TON of ‘ono-licious food! We used to set up a buffet “table” (which was really just a long row of plastic tablecloths on the ground) that stretched for what felt like miles–all piled high with great food. And it seemed like the line never ended! I’m not sure if it was people making their way through the line for the first time–or the 5th time. Or maybe the line was full of hungry New Yorkers who were in the park and came upon our buffet! We’ve “graduated” and we use real tables now, but the lines seem to get longer and longer every year. And the food gets better and better, too! The first year that I went, I thought I’d bring something that would please the whole crowd: a veggie-filled brown rice salad. How could that go wrong, right? Well… there was just as much brown rice salad in the bowl at the END of the picnic as there was when I placed it on the buffet! Auē! I learned my lesson and have switched to a slam-dunk version of mango bread which seems to please the local folks–both local to NYC and Hawaiian locals that are either living here or visiting. Can’t go wrong with mango bread! But the highlights of the picnic (for me, anyway!) are the music jams and the hula. Musicians come from all over–and as a Hawaiian musician in New York, it’s ALWAYS a treat to meet new folks, play some new songs and learn some new “tricks” on the ‘ukulele. Hula hālau and hula hui from all over the area come out to perform. The musicians form a makeshift “band” for the day and play for the different groups. It’s a chance to really share the Aloha spirit. There isn’t room for ego in a place like that… We are all ʻOHANA. We are all sharing in the music and hula. And we are all blessed for it! We’ve been honored to have music and dancing from all over the Pacific islands. One year, we had an ‘ukulele orchestra from Japan AND some of the cast from Hawaiʻi Calls! They had given a performance at Carnegie Hall the night before and stopped by to jam (and eat!) the next day. It was so wild to have a legendary vocalist like Nina Kealiʻiwahamana on our lineup at the picnic! From kupuna (elders) to keiki (children), everyone gathers to meet-up, talk-story, jam some tunes, dance some hula, and–of course–EAT some delicious food. 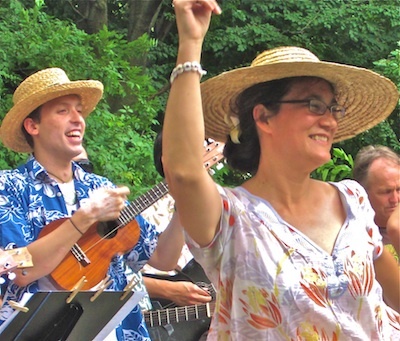 So if you guys are ever in town the first Sunday in June, you’ll know where to find the best in Hawaiian food, music and hula– in Central Park, of course !